Navigation: Home » Personal Finance » How Many Developers are There Per County in America? How Many Developers are There Per County in America? 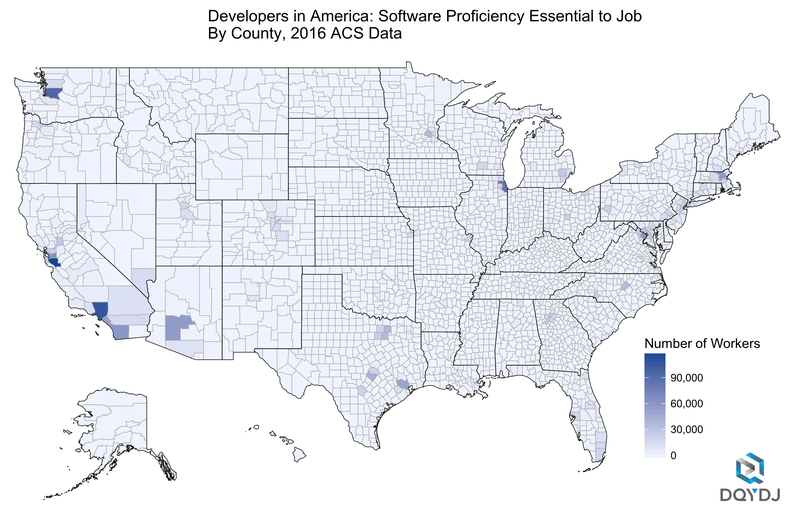 We’ve recently been trying to answer the question ‘How Many Developers are there in America?’, using the 2016 American Community Survey and BLS Standard Job Classification System. In our last article, we gave some answers: somewhere between 3.3 and 4.2 million workers required software proficiency at work in (full-year) 2015. Also in the last article we looked at some state-wide totals of developers; in this piece we’ll drill down to county-level estimates. We’ve broken down the county developer count in the same way as the last article. See our How Many Developers Are There in America? article for a discussion of which job categories are included in each category. We’ve generally gone from ‘almost certainly require development’ in Category 1 to ‘very high likelihood of proficiency required’ in Category 3. This article won’t rehash the discussion, but we’ve included our raw data export at the end of the article so you can choose whichever category you’d like to use to rerun these numbers. Since county sizes aren’t uniform (by land area or population), we’ve graphed and sorted the results by both number of developers and by proportion of total workers with software proficiency. A table ranking the percentage of developers by county and the number of developers in counties follows the choropleths. Not too many surprises here – Santa Clara County shakes out on top, followed by a number of counties in the immediate vicinity of Washington, D.C. Many other counties peppering the list are near Seattle, Los Angeles, Dallas, and Boston. Platte, Missouri and Linn, Iowa were interesting inclusions, though (at least for us – let us know if you live around there). And here are the top 50 counties by numbers of workers with software proficiency. Again, this maps to ‘Category 3’ in our initial definitions. Not too many surprises – but it’s interesting to see other counties bubble to the top (such as Cook County, Illinois) when ranking by the number of developers. The top 27 sees all 4 counties in the ‘Inner’ Bay Area in California, Alameda, San Mateo, Santa Clara and San Francisco. We also see many counties near Washington, D.C., Boston, and Dallas. Can I Have the Data? We’re made even higher resolution data available in the Developers per ZIP Code article. You can find the input CSV further down the page, and a calculator that divides the weights for you. It contains counties as well. It was interesting to slice the numbers in this way – while there weren’t a ton of surprises from our perspective, this exercise did bubble some unexpected counties up to the top. It also revealed what we all expected: California has a ton of developers, centered in the places you’ve heard developers live. One possible interesting result from this study: software folks know, but there isn’t much general press on how many software professionals are now located in and around Washington, D.C. There are many data centers, plenty of technical talent, and a healthy start-up ecosystem near the US capital. See anything interesting in this data? Do you live in any of these software-heavy counties? Did you formerly? Are you moving to one? Whatever your experience, please let us know in the comments. We’ll put together our highest resolution post on developers in America (zip codes) when we get a chance – it probably requires an interactive feature. Wondering if you might be able to email a copy of the raw data? I’m doing some market research and am interested in Utah County and SLC specifically – Category 1 data.